The botanical illustrator and writer Una Foster Weatherby (1878-1957) was an early student of New England gravestones. Born in Texas in 1878, Una Leonora Foster met a young pteridologist Charles Alfred Weatherby (1875-1949) while traveling abroad in 1910, and seven years later, the couple wed. As Charles advanced in his career to a position at the Gray Herbarium at Harvard, Una became his close associate, working with in the field and as illustrator and photographer. 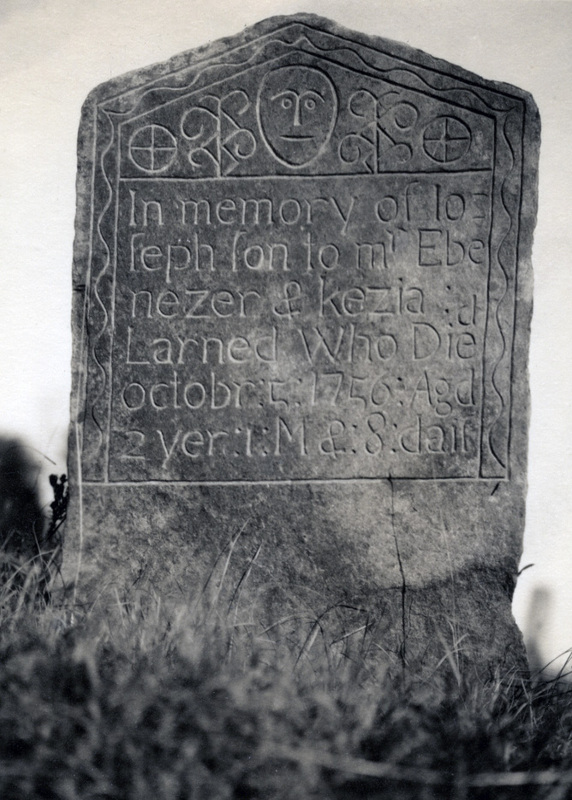 Among the many interests the couple developed was a fascination with photographing early American gravestones, and over the last three decades of her life, Una published occasionally on the subject. She died in Cambridge on August 17, 1957, and is interred with her husband at Center Cemetery in East Hartford, Conn. The Weatherby collection consists of a substantial typed manuscript illustrating early American gravestones, mostly from New England. Meticulously assembled, the manuscript is divided into six thematic sections based on gravestone design (death’s heads, winged cherubs, wingless cherubs, portrait stones, symbolic stones, and designs and willows). Each stone is represented by a single photograph pasted onto a page, along with a transcription of the epitaph and occasional comments on the design and date on which the information was recorded. Although most stones are from Connecticut and Massachusetts, a few stones from Virginia and South Carolina are included. A long time professor of the Russian language, Marshall Winokur received his B.A. in Russian from the University of Massachusetts (1965) and his masters (1966) and doctorate (1973) in Slavic Linguistics from the University of Pennsylvania. While working on his doctoral thesis in 1969, he began teaching Russian and German at the University of Alabama in Tuscaloosa where he remained for the duration of his academic career. His research on Russian culture and the fate of Russian Orthodox churches, convents, and monasteries under the Soviet regime resulted in numerous publications and talks. After retiring from the University in 1994, Winokur and his wife Janice settled on an old farm in Deering, New Hampshire, consisting of an old house built circa 1800, a three-story barn dating back to 1850, and a carriage house, and has since been involved in the local community and exploring New Hampshire history. The Winokur collection consists of hundreds of printed works pertaining to the history and culture of New Hampshire, about a quarter of which were published prior to 1900. Wide ranging in content, the collection includes state registers, directories, gazetteers, popular magazines, and a number of biographical works and local histories. Yankee Publishing was founded in 1935 by Robb Sagendorph, who saw an opportunity for a magazine devoted to depicting New England life and culture. 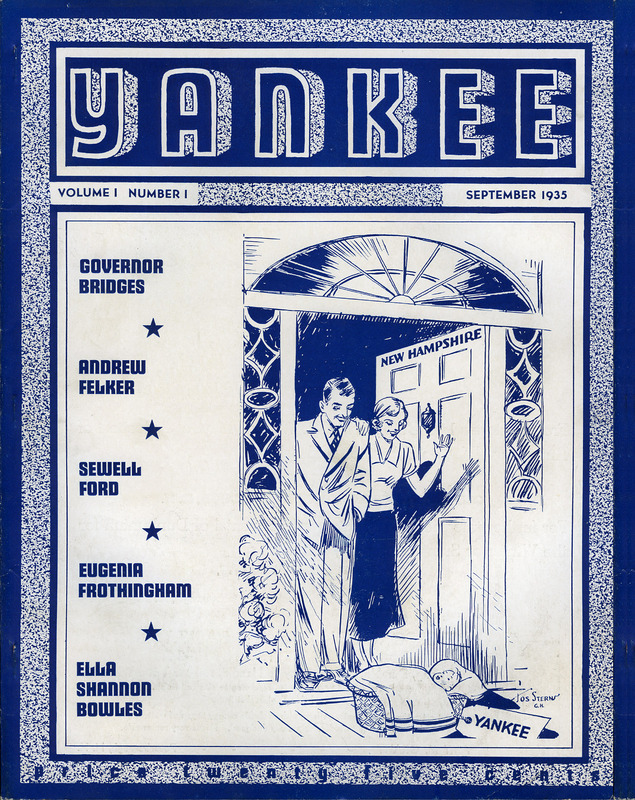 With an initial subscription of 614, Yankee Magazine was launched in September of that year and despite the hardships of Depression and war, it has thrived, becoming a beloved institution. In 1939, Sagendorph purchased publishing rights for the Old Farmer’s Almanac, which had been published continuously since 1792, and quickly restored it to profitability. Still based in Dublin, N.H., Yankee remains an independent, family-owned enterprise, with responsibilities passing to his nephew Judson Hale, son-in-law Rob Trowbridge, and grandson Jamie Trowbridge. Although the company has made forays into other areas of publishing, Yankee Magazine and Old Farmer’s Almanac remain its core business. The records of Yankee Publishing offer insight into the early years and growth of the corporation and its remarkable survival in age of media conglomeration. The collection includes two boxes of materials relating to the founder, Robb Sagendorph, and extensive correspondence, reports, memos, and other materials relating to Yankee Magazine and Old Farmer’s Almanac through 1999. In addition to nearly complete runs of both of the mainstay periodicals, the collection also includes a variety of materials accumulated by Yankee’s owners over the years, including several hundred glass plate negatives depicting New England and its characters.